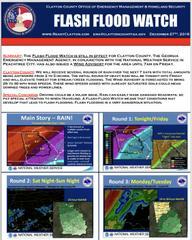 Summary: The Flash Flood Watch is still in effect for Clayton County. The Georgia Emergency Management Agency, in conjunction with the National Weather Service in Peachtree City, has also issued a Wind Advisory for the area until 7am on Friday. Clayton County: We will receive several rounds of rain over the next 7 days with total amounts being anywhere from 3 to 5 inches. The initial round of heavy rain will be tonight into Friday and will elevate threat for stream/creek flooding. The Wind Advisory is forecasted to bring 25 to 30 mph wind speeds. These wind speeds added with already saturated soils could mean downed trees and power lines. Special Concerns: Driving could be a major issue. Rain can easily mask damaged roadways, so pay special attention to when traveling. A Flash Flood Watch means that conditions may develop that lead to flash flooding. Flash flooding is a very dangerous situation.